Denver’s artistic journey began at age eleven when he was given his grandmother’s guitar. In 1963 he struck out on his own, moving to Los Angeles to be in the heart of the burgeoning music scene. It was during this time that Henry John Deutschendorf, Jr. was urged by friends to change his name if a recording career was to be in his future. He took his stage name from the beautiful capital city of his favorite state, Colorado. John Denver experienced his first major break in the music industry when he was chosen from 250 other hopefuls as lead singer for the popular Chad Mitchell Trio. Two years and three albums later, Denver had honed his considerable vocal talent and developed his own songwriting style. He gained recognition when his song “Leaving On A Jet Plane” was recorded by Peter, Paul and Mary, becoming their first and only number one hit. Denver began climbing up the pop charts as a solo act with songs like “Take Me Home, Country Roads,” “Rocky Mountain High,” “Sunshine On My Shoulders,” “Annie’s Song,” “Back Home Again,” “Thank God I’m A Country Boy,” and “Calypso,” solidifying his position as one of the top stars of the 1970s. In 1985 he was invited by the Soviet Union of Composers to perform in the USSR, inspiring the internationally acclaimed song “Let Us Begin (What Are We Making Weapons For? ).” The success of his visit lead to a concert tour of the USSR in 1986. These were the first performances by an American artist since the Cold War began. John Denver died tragically in a plane crash on October 12, 1997. Today, millions of fans old and new enjoy the work of this extraordinary performer. Thirty albums and four decades after he began, John Denver’s music is as relevant as ever. His humanitarian work continues to strengthen our global village, and his dynamic celebration of life, spirit and nature is a powerful inspiration to us all. 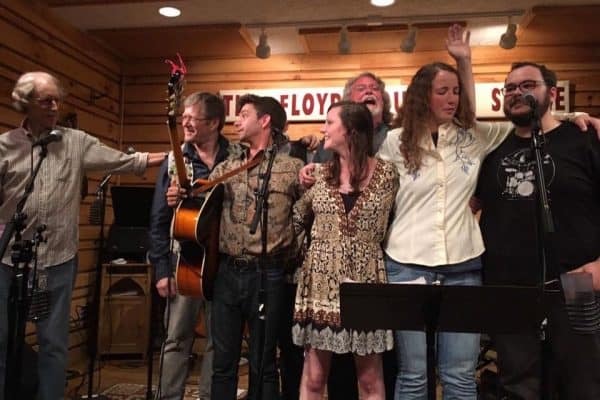 So plan to come out for a Tribute concert hosted by Souvenirs (David Cannaday, Dave Fason and Rusty May) along with special guests for the Floyd Country Store’s 6th Annual tribute concert of one of this country’s most enduring musical talents, John Denver! Out of stock! John Denver Tribute Show $15.00 $12.00 Tickets will be emailed.